Moroccan club Raja Casablanca made an impressive start to their 2015 African Champions League campaign by winning the first leg of their preliminary round tie 4-0 against Congolese visitors Diables Noirs. A couple of late goals sealed a convincing victory for the three-times former African champions, with Adil Karrouchy and Abdeljalil Jbira scoring in stoppage time. 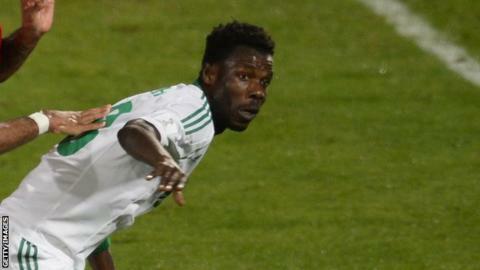 Ivorian Kouko Guehi (pictured) had put Raja ahead on 10 minutes with Nigerian Christian Osaguona adding a second. Raja should comfortably survive the return match in Brazzaville this month to set up a potential round-of-32 fixture with South Africans Kaizer Chiefs who needed a stoppage-time goal to pip Botswana visitors Township Rollers 2-1. Moghreb Tetouan, the other Moroccan challengers for the biggest prize in African club football, are in trouble after a 2-0 loss to CO Bamako in Mali. Abdallah Diarra scored both of Bamako's goals, converting an early second-half penalty and scoring from a free kick that caught goalkeeper Mohammed El-Yousfi napping. Defeat continues a run of disappointing international results for Moghreb, who were shocked by New Zealanders Auckland City last December in the Club World Cup in Morocco. Sewe San Pedro of Ivory Coast, unlucky losers to Egyptians Al-Ahly in the 2014 Confederation Cup final, suffered a shock home 2-1 defeat to Guineans Kaloum. Cheick Oumar Ballo gave Kaloum a first-half lead. Jean Christian Pathinvo levelled midway through the second half only for Kaloum to regain the lead soon after through Mandala Konte, with the woodwork depriving the Guineans of a third goal. Sewe have been weakened recently by the loss of goalkeeper Sylvain Gbohouo and midfielders Koff Kouame and Roger Assale to Democratic Republic of Congo giants TP Mazembe. Barred from playing at home because of the Ebola epidemic, Kaloum will host the return match in the Mali capital Bamako. Elsewhere, Real Banjul and Liberia's Barrack Young Controllers drew 1-1. It is the first time Gambian clubs have played in a continental competition since the lifting of a two-year ban by Caf. The return leg in this tie will also be played in Bamako due to the Ebola epidemic in Liberia. Al-Ahly Tripoli edged Egyptians Smouha 1-0 in a fixture moved to Tunis because of escalating Libyan unrest. Mohamed Al-Ghannoudi converted an early second-half penalty for Ahly, who are coached by former Dutch World Cup star Ruud Krol. Nigerians Kano Pillars triumphed 2-0 at South Sudanese Al-Malakia through second-half goals from Gambo Muhammed and Christian Obiozor. Kenyans Gor Mahia needed several brave saves from Boniface Oluoch to secure a 1-0 victory over CNaPS Sport of Madagascar in Nairobi. Ghanaians Asante Kotoko received a walkover after Sierra Leoneans East End Lions withdrew.